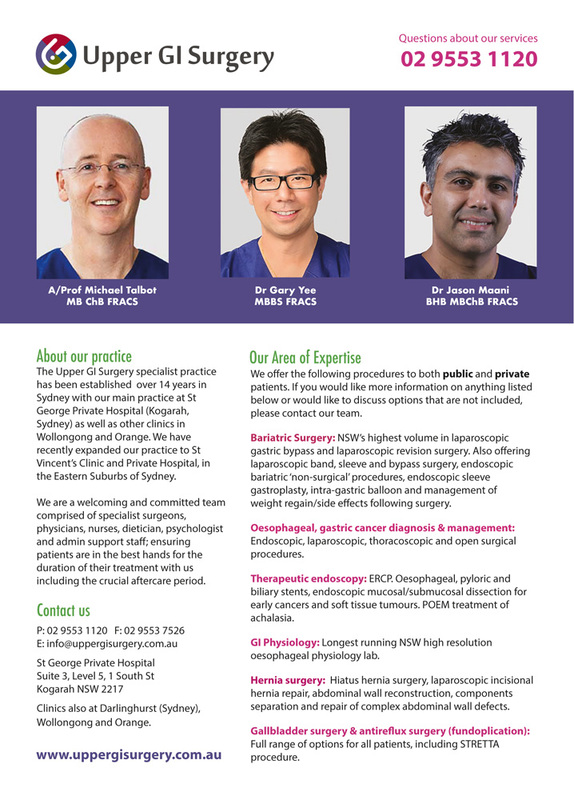 The Upper GI Surgery specialist practice has been established over 14 years in Sydney with our main practice at St George Private Hospital (Kogarah, Sydney) as well as other clinics in Wollongong and Orange. We have recently expanded our practice to St Vincents Clinic and Private Hospital, in the Eastern Suburbs of Sydney. We are a welcoming and committed team comprised of specialist surgeons, physicians, nurses, dietician, psychologist and admin support staff; ensuring patients are in the best hands for the duration of their treatment with us including the crucial aftercare period. We offer the following procedures to both public and private patients. If you would like more information on anything listed below or would like to discuss options that are not included, please contact our team. Bariatric Surgery: NSWs highest volume in laparoscopic gastric bypass and laparoscopic revision surgery. Also offering laparoscopic band, sleeve and bypass surgery, endoscopic bariatric non-surgical procedures, endoscopic sleeve gastroplasty, intra-gastric balloon and management of weight regain/side effects following surgery. Endoscopic, laparoscopic, thoracoscopic and open surgical procedures. Therapeutic endoscopy: ERCP. Oesophageal, pyloric and biliary stents, endoscopic mucosal/submucosal dissection for early cancers and soft tissue tumours. POEM treatment of achalasia. GI Physiology: Longest running NSW high resolution oesophageal physiology lab. Hernia surgery: Hiatus hernia surgery, laparoscopic incisional hernia repair, abdominal wall reconstruction, components separation and repair of complex abdominal wall defects. Full range of options for all patients, including STRETTA procedure.